So I spent nearly three years working at WestJet as a flight attendant, as recently as last August, and have, as a result, extraordinary respect for those who do the FA job. In fact, of the two solitudes — pilots and FAs — I’d say FAs have the far, far more difficult job. Yours truly during my days as a flight attendant. The photo was snapped by the first officer as we conducted the walk around prior to departure from a Caribbean destination I can’t recall. The aircraft is a Boeing 737-700. Yes, a pilot has more responsibility insofar as it would be difficult (although not impossible) for an FA to have a bad day and kill 136 people whereas when a pilot has direct control over those lives every time he or she takes the controls. But a pilot has the luxury of working behind a locked, armoured door and I don’t mind admitting I had some days where I was ready to head up to the flight deck, shut that door and never come out again. A sample? How about the day I was working as lead flight attendant (at WestJet all FAs are cross-trained on each position, meaning anyone can work as lead) and got a phone call just before a landing in Florida from the two FAs working in the back of the airplane, who informed me that a passenger had smeared human feces on the floor of the lavatory, and toilet seat, and the wall. I hung up, cradled my head in my hands and recall asking myself: How? Why? I charitably hoped that perhaps it was caused by a small child who ran into problems. Regardless, yours truly cleaned it up. As an aside, I will forever remember a certain awesome WestJet captain, a female, who came to the back of the airplane after we landed, as I was donning rubber gloves, and offered to do the cleanup herself. Is that an awesome captain, or what? WestJet pilots, most of them, are like that. Flight attendant training, at least at WestJet, is remarkably intense. For comparison, consider I spent three years in the Canadian Forces Reserves and completed the CF Basic Officer Training Program. Flight attendant training didn’t have the physical component of BOTP, or a crusty warrant officer or sergeant screaming in your ear, but in terms of pure stress I’d rate flight attendant training at least as difficult and possibly more so. Easy to see why. In an emergency it’s the flight attendant, not the pilot, who is going to get you out of the cabin alive. The aim of the training, in part, was to see who was going to break down and quit in a stressful situation and who was going to perform. Several members of my class didn’t make it through. In short, I liked the training. It was a good test. It was five-and-a-half weeks, conducted at WestJet’s Calgary campus. But the truth is I wasn’t very good at being a flight attendant. It’s just not something I’m wired for. I’m not one of those bubbly people types and I think it’s crucial to be that kind of person in order to be a good FA. You have to really like people and you have to really like helping people — even when they’re obnoxious in return, which they frequently are. Part of the problem was that every time I boarded the airplane I wanted to turn left, and head into the flight deck. Driving is where my real love was/is. And that’s part of the reason I took the job: If I didn’t yet have enough hours to fly a 737, I could at least ride on one. And get paid. And fly with my family for (nearly) free. I figured being a flight attendant would make me a better pilot (and I’d say it has) by making me respect and understand what FAs do and the extraordinary patience needed to do their job well. I certainly now know my way around the cabin of a 737. I additionally figured I’d learn some things from the pilots (and I did, no question). I watched approaches from the jump seat when flying standby. I accompanied one of the pilots on the walk-around on more than one occasion. And I got to ask a hundred questions that I would never otherwise have had the opportunity to ask. I liked getting to know the other FAs. I met some terrific, interesting people who did or had done all manner of things. I met one who was a part-time paramedic. One was a talent agent. One was a singer in a pop band in addition to being an Armed Forces navel reservist. More than one runs a successful business on the side. The good ones have the ability to absorb remarkable abuse and come up smiling. And I tip my hat to them. 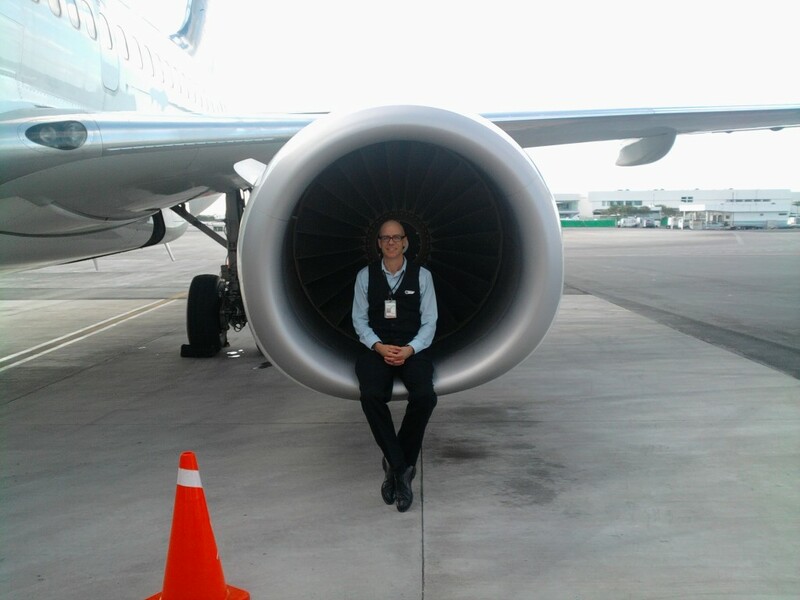 This entry was posted in Cabin Crew Corner and tagged FA, flight attendant, pilot, WestJet on January 2, 2013 by Craig Daniels.